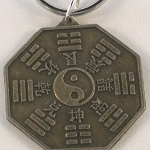 Copper tone Chinese Feng Shui Bell used for protection. This Safety Feng Shui Bell is used throughout China in Taxis to protect the driver and passengers from harm. 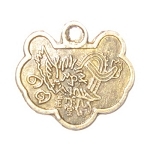 The Safety Feng Shui Bell includes embossed Chinese characters for Protection and Safety and embossed pictures of Kwan Yin Goddess of Love, Buddha Giver of Life, Tara Bringer of Compassion and Healing, and a powerful Fire Dragon. The ringer is a Wealth symbolic Gold Ingot with the numbers 99.99 on it to represent the purity of the gold. This beautiful bell hangs from an authentic Silk Chinese Mystic Knot. The Mystic Knot will bring you everlasting love, good health and long life, and protection from all negativity. Everything about this Feng Shui Bell will protect you and your family from negative energy and harm. This beautiful Feng Shui Bell is about 14 inches from tip to tassel, the copper tone bell is 3 inches high and 1.75 inches in diameter. The Safety Feng Shui Bell is substantial enough to hang by your front door or in a dangerous area of your home (like your kitchen or work area) to protect your home and your family.